By linking your Expensify and ParkWhiz accounts, your business-related ParkWhiz receipts will be forwarded automatically to Expensify. Follow the steps below to setup the connection. 2. Click Add Business Profile. 3. 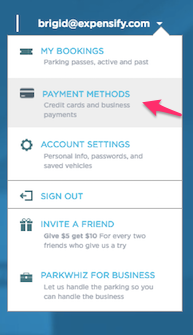 Enter your business email (which should match your Expensify email) and payment information. 4. Click Save and Continue. 6. Select your Business Profile as your payment method when completing your next ParkWhiz reservation, and the receipt will automatically populate in Expensify!